On Saturday 12 December 2015, delegates at the COP21 Paris Climate Conference signed the agreement that will form the core of the global response to climate change from the time it comes into force in 2020. While the deal was hailed by many leaders and commentators as a remarkable diplomatic success for its ambitious warming targets, representatives from indigenous nations around the world took to the streets of Paris to draw attention to the key clauses that had been removed: those that made binding commitments to the protection of human rights and the rights of indigenous peoples in climate change solutions. In the final text, all references to these rights were relegated to the non-binding, aspirational words of the preamble. Indigenous peoples have long been at the forefront of the battle against climate change, as effects of global warming such as droughts, flooding and heavy storms impact most heavily on the ecosystems on which traditional lifestyles depend. They also play a key role in defending natural environments through their struggle to protect their ancestral lands and resources from the incursion of external economic interests such as logging and mining companies. Environmental defenders such as these face a unique set of risks. As well as standing up to powerful interest groups, they are often marginalised both geographically and socially, working in isolated rural areas in conditions of extreme poverty, with poor communications and little access to legal protections. As competition for natural resources intensifies, their struggle becomes ever more dangerous. “Deadly Environment”, a 2014 report by campaign group Global Witness, revealed three times more murders of environmental activists in 2012 than ten years previously. A follow-up report examining the state of threat during 2014 showed no abatement in the trend, with 116 cases of killings of environmental activists. 40% of these victims were indigenous. A Global Witness campaign in the run-up to the Paris conference sought to focus attention on these environmental defenders, calling on COP21 leaders to do more towards their protection. Many human rights and environmental organisations hold that the omission of the indigenous rights clause from the final Paris accord represents the loss of an opportunity to strengthen the international law protecting land rights defenders and recognise the role that indigenous knowledge systems can play in climate change solutions . The solutions outlined in the Paris Accord instead focus on carbon offset schemes such as Reducing Emissions from Deforestation and Forest Degradation (REDD+), which allows reforestation schemes to be used to generate carbon credits that can be sold on the carbon market, and alternative energy sources such as hydroelectricity. Indigenous campaigners fear that REDD+ creates incentives for the appropriation of indigenous lands for use as carbon “sinks”, while accelerated construction of large-scale hydroelectric projects without appropriate consideration of indigenous rights is likely to result in the displacement of further communities from their lands. Many of the environmental defenders accompanied by PBI are already suffering for their opposition to such projects. One of the cases highlighted by the Global Witness campaign is that of Juan Francisco Martínez, a prominent member of the Independent Indigenous Lenca Movement of La Paz (MILPAH) in Honduras. 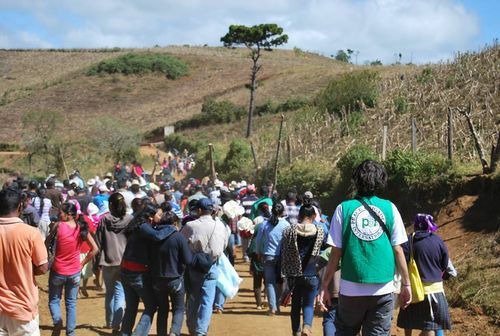 MILPAH is resisting the construction of hydropower projects on Lenca territory, and is supported by PBI through our accompaniment of the Honduran Centre for the Promotion of Community Development (CEHPRODEC), which provides advice and representation to the Lenca movement. Juan Martínez was found stabbed to death in January 2015. He is one of three members of the community to be killed this year. Two other leaders of the movement were detained by police, exemplifying the criminalisation of environmental defenders that stronger legal protections for indigenous land rights would help to prevent. Indigenous campaigners advocate a holistic approach to climate change, one which centres on an intimate understanding of the interaction of natural elements and prioritises locally designed strategies for sustainable environmental management, as well as emphasising the importance of leaving fossil fuels in the ground. For this vision to be achieved, it is crucial that indigenous land and resource rights are respected, and environmental defenders protected.